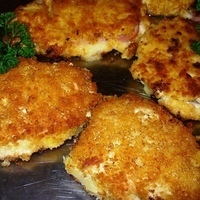 Home » Recipes » Chicken Cordon Bleu - Schnitzel Style! I fell in love with veal cordon bleu prepared schnitzel style in restaurants while living in Germany in the late 60's. But stateside, veal was hard to come by when I first began to replicate the recipe, so I subbed chicken breast. I have come fairly close to the 'authentic' versions my memories provide of this delicious main dish. I suppose schnitzel style offers more surface area for the yummy coating than does the traditional roulade or rolled style Cordon Bleu. Over time I have tried many crumb types for the coating but have finally settled on Japanese style bread crumbs like Panko for crispiest texture. The only garnish/seasoning I used previously was fresh lemon wedges; lately I've experimented making a cream sauce of chicken broth, white wine and cream. See Photo 12 for general sauce directions. You won't need many ingredients to make this schnitzel, but it's a tad messy and tricky to prepare so I included a tutorial of photos. I hope you'll try this "Blue Ribbon" recipe soon. It's a pleaser! Heat 1/4 cup of the oil in large flat skillet over medium heat. Place beaten eggs and bread crumbs in separate wide flat bowls and set aside. Select and pair up the chicken breast cutlets equal in size; you'll need 2 to make each schnitzel "sandwich" and depending on size, each sandwich will serve 2 people generously - four for the whole recipe. Place between wax paper (I recycle my cereal and cracker liner bags for this because they are so durable and will stand up to the pounding - see photos); using mallet pound to thin each to a thickness of 1/4". Place a slice of ham on one of the thinned chicken cutlets and on top of that a slice of Swiss cheese; trim the ham and cheese to fit the chicken cutlet shape. Top with the matching thinned chicken cutlet to form the sandwich. At this point you may need to cut the sandwich in half to serving size, so it is easier to handle, coat and cook. Holding each sandwich firmly, dip it into beaten eggs coating one side completely; then carefully turn it over and dip the second side in eggs, allowing excess egg to drip away. In like manner coat both sides with bread crumbs. Place into heated oil in pan and fry til golden brown on both sides, adding the additional 1/4 cup oil as needed. I made these this past weekend, and they were very, very good. The only changes I made were to smear some Dijon mustard onto the chicken breast before laying on the Swiss cheese and ham, then dredged them in flour before dipping into the egg and the bread crumbs. The Dijon is just something I have always added for the extra little touch of flavor, and I find that the flour helps the crumbs to adhere to the chicken better. Thanks for sharing, they were truly delicious! These look way better than the traditional ones and can't wait to make them. They look like a explosion of flavor in every bite. will post back to let u know how they went over. Thanks for your comments and I hope you do get back with your constructive critique of this recipe when you try it out. "Explosion" is a good way to refer to the divine yumminess every forkfull gives! With all those wonderful photos illustrating the recipe step by step, my mouth is watering already ! Wish all recipes on this site were as well photo-illustrated as yours. PS: I might try FROSTED FLAKES in place of panko as the crumb coating. Haha, just kidding, they're not THAT great. This was fantastic!!! I thought putting it in the egg and bread crumbs was going to be hard but it really wasn't that bad. Just make sure your using a large plate and you have plenty of room to use both hands. I made it exactly the way it was written I just added a lemon/butter cream sauce on top. Will definitely make this again! Michelle ~ It's thrilling and gratifying to know you tried this version of Cordon Bleu and hit a bulls-eye. Thanks for your feedback! making this today. looks great! I used to eat this allot in Idar-Oberstein,Germany.. Thanks Frosted Flaker for your comments. I thought the technique would need a good pictorial, as it's a little tricky. And yes, I agree that Tony the Tiger's favorite cereal wouldn't be that "Gr-r-reat" as a crumb coating! Thanks A.L.! I will give your tips a try next time I prepare it.